Yesterday was spent in unloading the containers holding the electrical ground support equipment, or EGSE, and other equipment. We also set up the office areas. 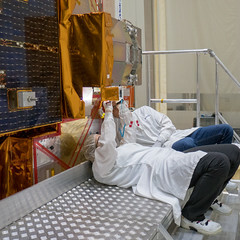 The first Swarm satellite ‘SC-1’ was moved to clean area 101A and left in its sealed container so that it could acclimatise overnight. The container door was then opened this morning and SC-1 was taken out. This afternoon the second Volga-Dnepr cargo aircraft landed and the new cargo with the second Swarm satellite, SC-2, is being transported to the MIK General Hall. The plan is now to move SC-2 to clean area 101A on Saturday morning, rather than on Friday 20 as previously planned. On Saturday afternoon the third and final flight with SC-3 will also arrive, and SC-3 will move to 101A on Sunday. Despite a slight reshuffle of operations, the milestone of having all three satellites set in clean room 101A by Sunday evening will then be met. I will fly back with Volga-Dnepr to Munich and returning to Plesetsk with SC-3 on Saturday afternoon. My next report will be sometime Monday, the 23rd.